On the way up the winding road to the Cameron Highlands we stop at a strawberry stall and buy fruit so red and juicy they stain our fingers scarlet. We pass many more strawberry stalls and shops selling honey and fresh vegetables. There are also rose gardens, blooming chrysanthemums and rhododendrons. Up here in the cool crisp mountain air the English in Malaysia escaped the heat of the lowlands and transplanted their European life to the tropics. 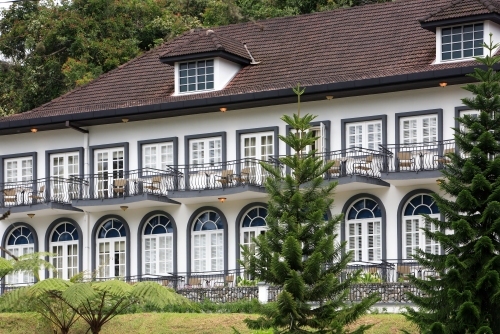 Just like the hill stations of India the Cameron Highlands were the colonial version of an English country garden and when their work as civil servants and rubber plantation owners became too much the British came here to a little slice of home. They built bungalows like English cottages [link to Glenburn], played rounds of golf, and took invigorating country walks, all accompanied by copious cups of tea. Tea. I say, what a jolly spiffing idea. How fortunate that one arrives at Cameron Highlands Resort just in time for traditional afternoon tea. There is also scones and strawberry jam, tiered plates stacked high with sugary cakes and of course the ubiquitous cucumber sandwiches, Lady Bracknell would have been proud. Cameron Highlands Resort is part of the YTL group which includes Tanjong Jara Resort on Malaysia's east coast and the star-studded Pangkor Laut Resort so I am expecting a certain level of service. The tea menu is suitably impressive; as well as the usual Lapsang Souchong and English Breakfast there is vanilla, clove and cardamom, lime and ginger and Bunkit Chedu No 53 which I simply must try my dear because it is described as 'robust, strong, brisk and full-bodied'. Now that should blast away the travelling cobwebs. Tea is poured into bone china cups and one feels constrained to drink with one's little finger at an angle lest one offend one's fellow tea-takers. If I stay here much longer I won't be able to stop talking like this and will probably be compelled to put on a flowered frock and gloves. It is as if I have time-warped back to those old colonial days. The floors under my feet are dark polished wood and there is a grand piano, planters chairs and aspidistra plants in pot. Over in the corner an antique wind-up gramophone. We're in the Jim Thompson Tea Room and therein lays another interesting tale. Jim Thompson, Thai silk exporter and CIA agent , set out from Moonlight Cottage for an Easter Sunday walk in the highlands March 1967. He left his cigarettes and a silver case on the chair outside the cottage, suggesting he didn't intend to be gone long but he was never seen again. There are numerous theories about the reason for Thompson's disappearance. Some say he became a tiger's lunch, others that his spying days caught up with him. Listening to local Thompson tales certainly keeps us entertained. The cottage he stayed in is just above Cameron Highland's Resort and a guide can take you there although it is not generally open to the public. With all this decade old speculation I simply have to go on the resort's two hour Jim Thompson mystery trail. As we walk through curling jungle, past clear streams and twisted vines I can't help thinking, maybe Thompson just got lost. It wouldn't be so hard to do. Cameron Highlands Resort offers a full range of guide walks from my little trek to full day hikes to cascading waterfalls. At the end of hard days hiking a whiskey in the Highland Bar keeps up the colonial tradition. At the end of hard days hiking a whiskey in the Highland Bar keeps up the colonial tradition. We then repair to the dining room for more hearty British-style fare including beef Wellington, Black Angus ribs and baked salmon en croute. For desert there is apple and butterscotch crumble, rice pudding brulee or wild fig and sticky date pudding. Clearly I haven't exerted as much energy during the day as the table of Chinese hikers behind us, they all tuck in with gusto. I am less gung ho and regret I didn't choose salad. After dinner I retire to my bedroom and flop on the four-poster - to say I am 'replete' would be an understatement. Eating and drinking like this all the time must surely have contributed to the demise of the British Empire I decide, because no one can do this on a daily basis and function. Luckily the resort also has Gonbei Japanese restaurant and I vow I'll eat sushi tomorrow. Undulating green tea plantations cover the hills around the resort and one of the ultimate experiences is to go on a private picnic in the nearby BOH plantation and drink your brew surrounded by nothing but row upon row of clipped green tea bushes. Since the theme of our stay is clearly tea I can't resist the spa's signature tea bath followed by a massage. My private Spa Village room has a deep claw-footed bath and white shutters. It also has a small flat-screen TV and head phone, which frankly I could do without. I prefer my spas without the technology. Nevertheless as I sink back in my tea and chysanthemum bath, having scrubbed my face with loose leafed tea and put tea bags on my eyes , I reflect that really tea is wasted on the drinkers; this is much more refreshing than a cup of Twinings. Check in: Cameron Highlands resort, 3900 Tanah Rata, Cameron Highlands, Pahang Darul Makmur,Malayisa.tel; (605) 491 1100. Ultimate Luxury: The flowers, the views, the fresh air. Most Indulgent Moment: A tea bath followed by any treatment in the spa. Insider Secrets: Your walking guide will tell you stories of what the locals thing really happened to Jim Thompson.